Many people are so frustrated working within hierarchy and bureaucracy that when they are introduced to beautiful engagement processes like World Cafe, Circle Practice and Open Space, a new love affair begins. These methodologies are powerful in re-igniting passion, hearing every voice, creating mindful and thoughtful conversational spaces that take individuals and groups into new territory. The love affair becomes a bit jaded when people begin to say, “Conversation is great, but what about doing something? Where is the action in these methods? Where does decision making rest?” As if creating meaningful and relevant conversational space and decision making or action are mutually exclusive. In many cases though, people haven’t figured out how to make them work well together. It is not either/or. It is and. What is the leadership and understanding necessary to find the balance that invites both broad based engagement and effective decision making leading to wise action and movement on initiatives, especially social change initiatives inside organizations and systems? What does it take to truly shift the shape of the world we live and work in? Recent conversation with with Toke Moeller and Bob Wing in Brazil has sparked my curiosity and reflection on the relationship between the circle, triangle and square that we often reference in the Art of Hosting. The circle represents the social technologies that engage people in deeper, more inclusive ways, tapping into human longing for connection and meaning. Circle is an ancient and universal symbol of unity, wholeness, infinity, the goddess, and feminine power. It represents the sacred. 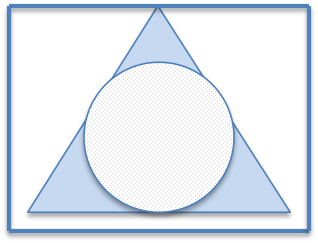 The triangle represents hierarchy and structure within which so much work happens and decision making takes place. When the triangle points upwards, it symbolizes fire, male power and the masculine archetype. The energy of doing and of action. The square represents the physical world in contrast to the sacred. In relationship with the circle and triangle, the square represents new forms of governance, stewardship or strategic thinking partnerships. Much of the intention behind or underneath circle or engagement strategies is to share leadership and responsibility more broadly. We are not always clear on what that means. Sharing it doesn’t mean foregoing it as sometimes happens as people begin to experiment and play with engagement strategies. A point is often reached where things feel stalled because we are not always clear where decision making fits or how to do it well. Sometimes change processes fail because leaders are not clear on how decisions will be made in conjunction with engagement methodologies. They then “take back” decision making which seems to disempower the move toward shared leadership and shared responsibility. Yet, very little gets done without decisions being made. Clarity around decision making allows for stronger relationships and more powerful work processes. Understanding the need for and how the circle and the triangle work together creates the space for more intentionality in processes and relationships. There is not just one form of decision making that should always be used. Sometimes consensus decision making is the most appropriate decision mechanism. Other times decision making will be vested in an individual or a team that sits elsewhere in the organizational structure. The lack of clarity around who makes what decisions when and how information flows is more likely to lead to problems more than the type of decision making structure. The degree of trust inside of the relationships also has an impact. In organizations or systems where the trust is high, decisions are trusted and respected no matter who makes them. In organizations or systems where the trust is low, of course decisions are questioned and sometimes disrespected. Quality of relationship can be improved through the circle, thus supporting the triangle better. Clear decision making processes improve quality of relationship. The circle and triangle are nested inside of the square. If the square is equated to stewarding or governance, the role of the square is about holding space and perspective from a strategic, bigger picture point of view. Not so active in the decision making structures or in the conversational space but bringing the awareness of deeper patterns that relate to or underly any given process, initiative or movement, providing insight and perspective that then feeds back into the engagement (circle) and decision making (triangle) processes. The danger lies not in any of these specific shapes. It is in becoming enamoured with any one of them to the exclusion of the others or disenchanted with one to the point of not wanting to engage it at all. As I consider the work in front of me now, I will bring this deeper curiousity about the interrelationship between the circle, triangle and square into my process and coaching considerations, particularly as it relates to new leadership competencies required in a rapidly changing world.